The city of Loyettes is a small town located south east of France. The city of Loyettes is located in the department of Ain of the french region Rhône-Alpes. The city of Loyettes is located in the township of Lagnieu part of the district of Belley. The area code for Loyettes is 01224 (also known as code INSEE), and the Loyettes zip code is 01360. The altitude of the city hall of Loyettes is approximately 192 meters. The Loyettes surface is 21.28 km ². The latitude and longitude of Loyettes are 45.776 degrees North and 5.207 degrees East. Nearby cities and towns of Loyettes are : Chavanoz (38230) at 2.94 km, Anthon (38280) at 3.30 km, Pont-de-Chéruy (38230) at 3.45 km, Saint-Romain-de-Jalionas (38460) at 3.47 km, Leyrieu (38460) at 4.25 km, Charvieu-Chavagneux (38230) at 4.81 km, Tignieu-Jameyzieu (38230) at 4.93 km, Saint-Maurice-de-Gourdans (01800) at 5.20 km. The population of Loyettes was 2 331 in 1999, 2 418 in 2006 and 2 439 in 2007. The population density of Loyettes is 114.61 inhabitants per km². The number of housing of Loyettes was 1 013 in 2007. These homes of Loyettes consist of 944 main residences, 17 second or occasional homes and 52 vacant homes. Here are maps and information of the close municipalities near Loyettes. Search hotels near Loyettes : Book your hotel now ! 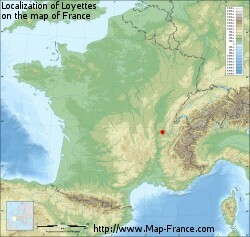 At right you can find the localization of Loyettes on the map of France. Below, this is the satellite map of Loyettes. A road map, and maps templates of Loyettes are available here : "road map of Loyettes". This map show Loyettes seen by the satellite of Google Map. To see the streets of Loyettes or move on another zone, use the buttons "zoom" and "map" on top of this dynamic map. To search hotels, housings, tourist information office, administrations or other services, use the Google search integrated to the map on the following page : "map Loyettes". Photo of the city of Loyettes or neighboring municipalities	 Loyettes (01) 31 janvier 2014. Le Rhône vu vers l'aval. Photo of the city of Loyettes or neighboring municipalities	 Loyettes (Ain) Les Bords du Rhône 31 12 2012 (Le pont avant sa rénovation). Loyettes (01) 31 janvier 2014. Le Monument aux Morts. Pic of the city of Loyettes or neighboring towns	 St-Romain-de-Jalionas (38) 31 janvier 2014. Le Rhône vu vers l'amont. A gauche le dpt de l'Ain, à droite, le dpt de l'Isère. J'ai pris la photo dans l'Isère à quelques mètres de la "frontière"!!! St-Romain-de-Jalionas (38) 31 janvier 2014. Vue vers Loyettes (01). A cet endroit, le Rhône fait frontière entre les départements de l'Ain et de l'Isère. This is the last weather forecast for Loyettes collected by the nearest observation station of Belley. Week Forecast: Light rain tomorrow through next Tuesday, with high temperatures peaking at 24°C on Thursday. The latest weather data for Loyettes were collected Tuesday, 23 April 2019 at 19:48 from the nearest observation station of Belley.